MusicMaster/iTunes Integration | by Aaron Taylor – WELCOME TO OUR INTERNATIONAL SUPPORT! 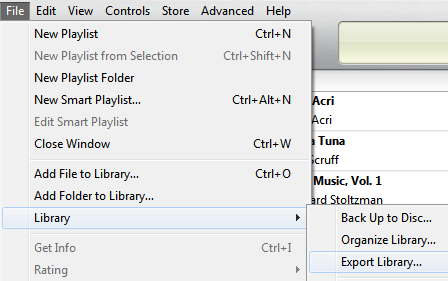 Want to add your song data from iTunes straight into MusicMaster? How about creating playlists that can then be played out via iTunes? There’s got to be a way, right? In this article, we’ll lay out the steps to do just that. First off, you’ll want to get in touch with your MusicMaster Scheduling Consultant to discuss your needs and plans. They will assist you in reviewing your database(s) to identify whether additional fields will be needed to allow the integration to work. Your MSC will also provide you with the needed files to add to your database, and your Music Master directory. 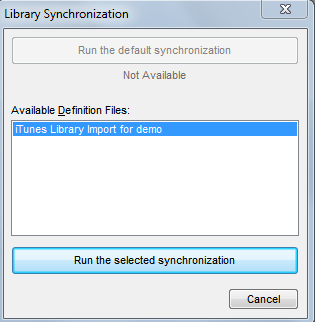 Your MusicMaster Scheduling Consultant will need to forward you our library synchronization.def for iTunes (we’ve already done most of the set up work on this for you). We’ll likely need to schedule a call/GTM session with you to direct on configuring where the library file from iTunes will be sent, and where the field data from that program will be imported into MusicMaster. That shouldn’t take more than five or ten minutes. Once this is customized to your database, then you are ready to go into iTunes and export your library to MMWIN. In iTunes, you will want to go to FILE-LIBRARY-EXPORT LIBRARY. The library.XML will then appear in the directory you designate in the export path in iTunes. Once that step is completed, you’ll then go to your MusicMaster database and run the library synchronization def. When you run the synchronization, you will find the songs you imported from the iTunes library in the NEW category list (this category will be created for you automatically if it does not already exist). 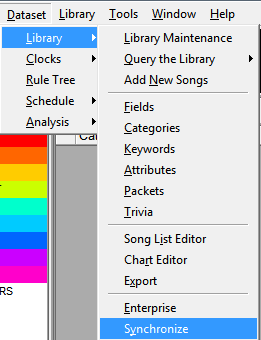 From here, you’ll likely add the songs to their proper categories and get ready to schedule a playlist for export. 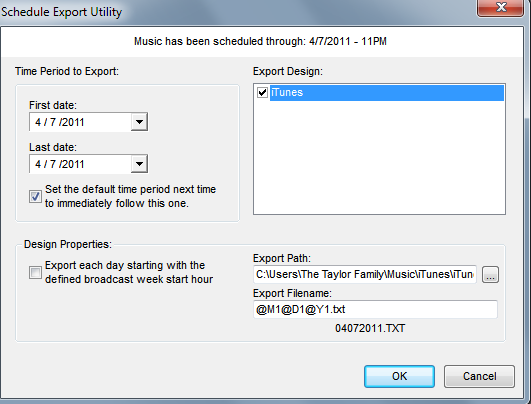 Your Music Scheduling Consultant will also need to forward you our export XML template for iTunes, (again, we’ve done most of the work here already), and we’ll just need to align the fields in the template design to the available fields in your database. If you’ve had prior experience adding in a “template” design we’ve provided to you in the past, this is the same procedure. Of course, we are happy to assist in this process! This is done via the MMExportDesignEditor.exe found in your c:\mmwin directory. Next, we’ll assume here that you’ve already scheduled and edited a playlist; you wish to export to iTunes. 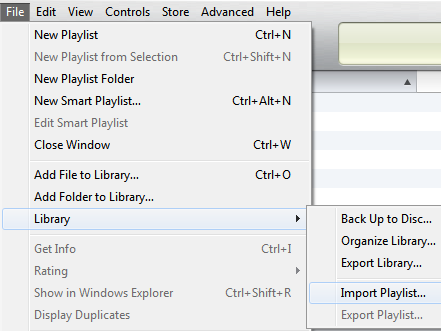 Now, you’ll want to go ahead and export the playlist you’ve created to a place that your iTunes can find it. Export the playlist the same way you export currently…DATASET-SCHEDULE-EXPORT-EXPORT TO AUTOMATION. Select your iTunes export this time, and you probably should double check the Export Path and Export Filename boxes at this time as well. Once the file has been exported, go to your iTunes application and import the playlist. If you’d like more information on the set up of this functionality, or further assistance, please contact your Music Scheduling Consultant for assistance.